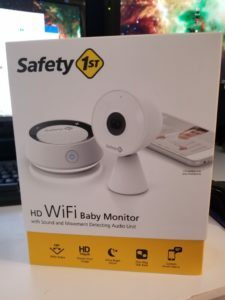 The Safety 1st HD WiFi baby monitor is a USB powered wireless 720P camera with a companion audio disk for if you want to listen in on your little one. It’s a bit different from other cameras I’ve dealt with in that there is no wired option, the setup is optical via QR codes, and in a scenario where you travel a lot you could probably just print out the QR codes the app uses to program the camera. No subscriptions, one price does it all. It comes with an extremely long power cord. Long enough that you’ll need to do something about it most likely as it’s not safe. They provide plenty of ways to shorten it so there’s no wires laying about for a little one to get in, so not a huge deal. The Safety 1st also comes with a little audio disk that allows you to listen in and tell baby you’ll be there. The range on this is dependent on your WiFi, but longer distances should be ok as audio really does not take up much bandwidth. 720P 30FPS video means you’re getting about broadcast HD quality in network. You can change this to a lower FPS or resolution if you want. Key here is this is possibly the first camera I’ve been able to see a baby breathing in the dark, I could probably do that with 15 FPS, definitely can with 30. You’re not using the camera via WiFi except when you’re watching it or it captures an event, so feel free to experiment. You won’t miss a moment with a too high bandwidth, you’ll just get some choppy video. 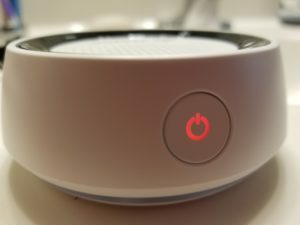 The audio disk is pretty cool – if you don’r want to devote your phone to being a baby monitor it’ll let you know when there’s any sound in there. The delay is about a half of a second so things tend to get weird when someone is talking but it otherwise does a very good job for when you’re paranoid, but not that paranoid. You can also talk back to baby and let it hear a cyclops saying “we’re coming for you… baby” because that won’t mentally scar them. 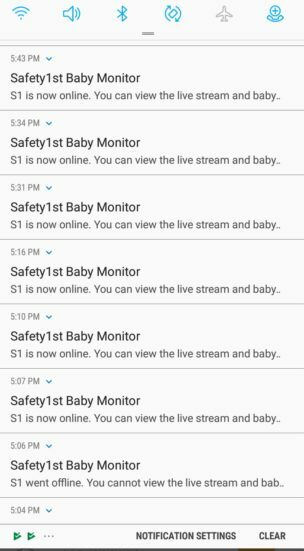 You can crank up the notification sensitivity on your phone to get an alert the instant there’s noise, movement, etc from a monitored baby. Or crank it down if you’re mostly just wanting to know when they wake up and are ready to get on with their day. Captured moments get shot to the cloud and deleted after 24 hours. You can delete them if you don’t want others seeing your rear end as you shot in from the bathroom because baby sounded like she was choking and you tripped and ended up on camera. Not that that’s ever happened to me you know, but sure it’s something people worry about. I will point out that the video is great. I’ve had better, but not from anything with “baby” in the title. You want to run a wired POE 4K camera into the baby’s room? It’s going to blow the quality of the Safety 1st HD WiFi Baby Monitor out of the water. That said, I don’t think you do. Also don’t think those generally have audio. As a computer tech I’d be more on the side of making your own baby monitor generally, but I’ve got to admit this was a simple setup, I don’t think I ran into any issue other than I was on the wrong network when I tried to set it up. I plugged it in behind a Bitdefender box and did a few scans for vulnerabilities, nothing in particular but I’m keeping it there for the time being. It claims to have a built in firewall and data encryption and encrypted cloud storage and secure web transfer, so hopefully we won’t have a repeat of some of the Foscam fiascoes we had with easily found cameras. You do seem to have to be paired with an account to locate it. I found that the motion alarm in default settings was triggered too aggressively. If the light went up or down outside as a cloud went by you’d hear a click as the camera adjusted and then get a motion warning shortly afterward. This is probably not going to be an issue in a room with blackout curtains or at night, but just something to note if you’re getting inundated with movement alerts, it could just be the camera yelling at clouds. Should be noted that this thing does not appear to be capable of working without internet. Like with the foscams and amcrest stuff we’ve looked at in the past you could always do a local stream, the software here doesn’t seem to support that. The software’s designed so you can provide temporary access for sitters, nest parenting, or grandparents. It seems like they’ve got a pretty decently designed app as well. I see no way to easily bond it with other apps, so pretty sure this will be a baby camera for its entire use run. Video can be downloaded from the cloud, but I do not have a test at the moment on what happens if the internet goes down while it’s recording. I’ll try and get an answer on that as the way my network is currently set up it’s difficult. You can run this off of a portable phone bank battery if you need to. I find this very cool. They do not want you doing this because those things can’t be trusted and they can’t guarantee you a good experience. That said, if you need to get a baby monitor up and running at a friend’s house while your kiddo is PTFO, it’s something to remember is a possibility. I wish I’d had this five years ago. I lost track of how many hours I probably spent staring at a screen watching my little one sleep. With her, if I got within 100 feet she woke up and didn’t go back to sleep for hours. Fun times. At $199 it is honestly priced right where it needs to be for anything with “baby” in the title. 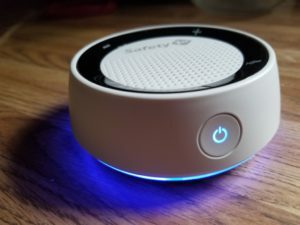 If you can grab one for less, do it but it’s a product that has taken the lessons of other baby monitors and run with them to product a really good product out of the gate. It may seem odd, but I actually use anything I review and continue using it. I decided to re-purpose this while I was on vacation so that I could watch my dining room and living room while I was on vacation. The first issue was it was triggering for things I couldn’t see. A could would go by and I’d get a motion alarm. OK, 20 false alarms thinking I had burglars in my house and I managed to get the sensitivity adjusted down well enough that was not an issue. Then something happened where the app started crashing all the time. I’d get a notification of movement, click the app, crash. They appear to have pushed an update on July 9th which seems to have fixed the crashes. After the app was stable the camera started disconnecting from WiFi. Being on the other side of the continent I could not do a lot of troubleshooting except I was able to see the internet was never going down and the WiFi access point did not appear to be bouncing. Attached picture on the right you can see it was anywhere between 12 and 40 notifications an hour. I finally had to mute the thing. When I got back home the camera was on and functioning, then I heard it ding, I heard it ding again, noticed I had a couple of notifications again, it had disconnected. As I’d just gotten off a redeye flight from Oregon through San Francisco I was extremely tired so rather than doing much investigations I unplugged it and plugged it back in and it worked. 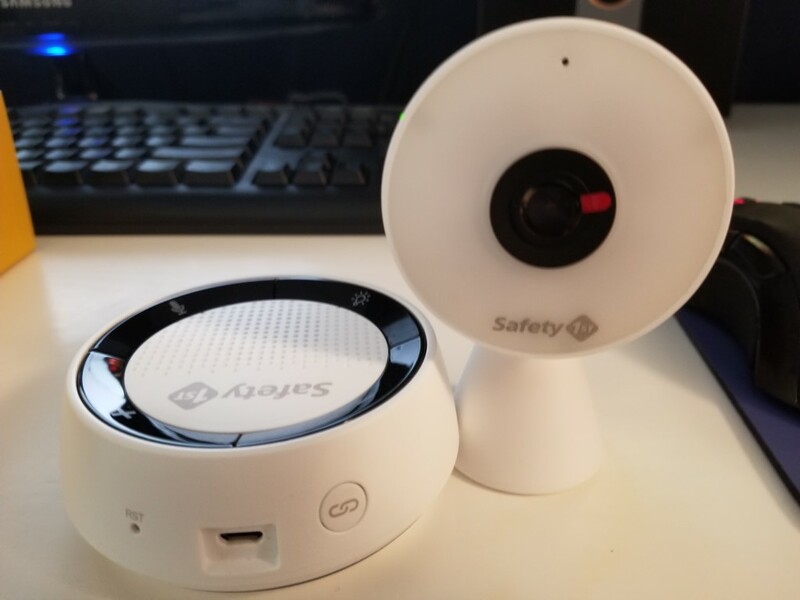 While the Safety 1st Baby Monitor is not sold as a home monitor, it is also was not particularly stable for week+ use. Perhaps this will be addressed in a firmware update, or maybe I just had one instance where I just had a camera that needed rebooting. Not something I’m going to leave running for weeks on end again, and not something that’s sold claiming it will do that.